For Cee’s Oddball Photo Challenge. To me, the thing that’s oddball about this is that it’s proudly sitting on the sidewalk!! Which is a huge no-no around here. And it’s a rust bucket proudly wearing new tires striped to match. I wonder if they’re going to keep it like that. I don’t know the make or model, if anyone does please share. This is the biggest button & needle I’ve ever seen. Taken in the garment district where all things sewing can be found. If you make your own clothes, it’s heaven! This entry was posted in art, blog, photo, photography, wponthego and tagged Brookkyn, cee's oddball photo challenge, New York, vintage car. Bookmark the permalink. Cool! I love h button & needle. I think the car is an Oldsmobile Eighty-eight, 1958, maybe? Both of your photos are great for odd balls. I absolutely adore the info center. 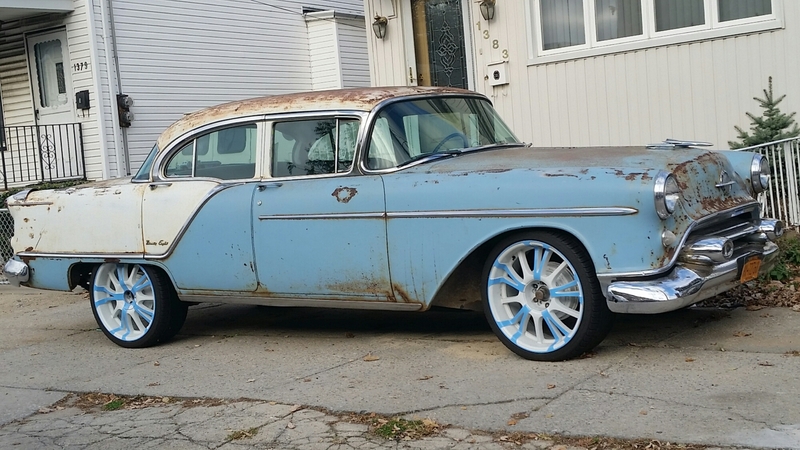 The Oldsmobile is a ’55, and those wheels are outrageous! Nice photo catch.